General public (from 3 years old and up). Funny, tender, lively and intimate – such is the secret universe of Séraphin Lemercier, the little conservative suburbanite who takes a trip across the sea, fights a dragon, happens upon a mermaid egg and finally achieves his heart’s desire. The audience will finally discover that his inner personality is actually that of an archangel. This surprising show can be enjoyed by people of all ages. The sea is brought to life by a group of children who are invited to participate under the benevolent gaze of their parents. 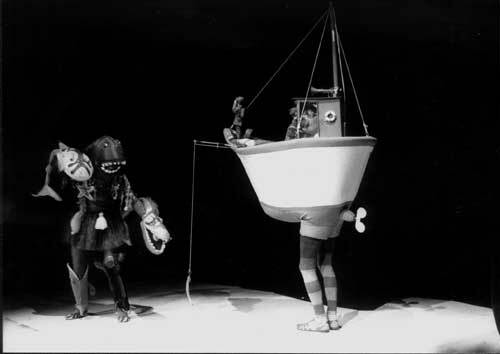 Actors and puppets play together in a series of sketches where the scenery is worn like costumes. 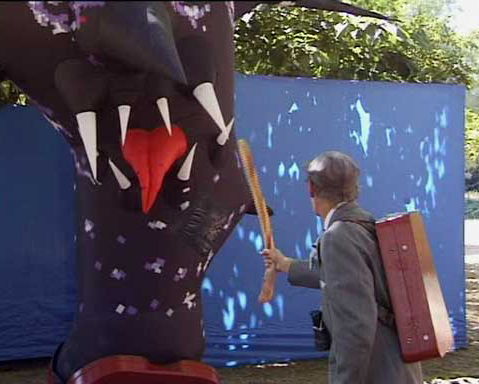 A giant dragon pops out of a suitcase, etc. Surprises galore! Relationship to the audience : The audience should be located at the same level as the acting area. People on tour : 2 actors (couple). Add 1 stage manager in the event of a heavy touring schedule. To die for! 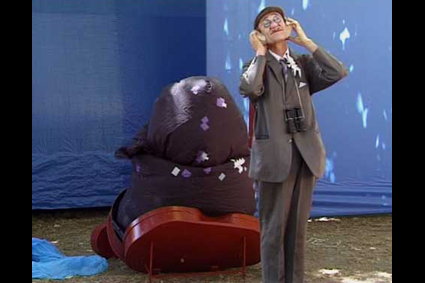 A very fine recipe: mixing ingredients of theatre, dance and puppetry. Fog horn: surprised onlookers step aside. The closest body of water is 500 kilometers away. However, there really is a boat coming up the street. The small, colorful watercraft cuts through the crowd, at a slow waddle. Astonishment and laughter. The passers-by linger, the audience comes into being and a circle is formed. We are elsewhere. Scenes of fishing, storms…..
COATIMUNDI overflows with fantasy and so many times situations will evolve in totally unpredictable ways! The décor and the puppets are extremely beautiful, peacefully playful, and with a gentle touch for children. In this silent show, it’s the heart that speaks. HATS OFF TO THE SEA is where gloominess is overcome by fantasy, pettiness is conquered by tenderness. An excellent way to spend time with your children. The show began with the exquisite appearance of the COATIMUNDI company….surprising and comical situations. Whoever sees this will never forget it! Without saying a word, the French actors told us the most beautiful story of a trip a man has ever made. 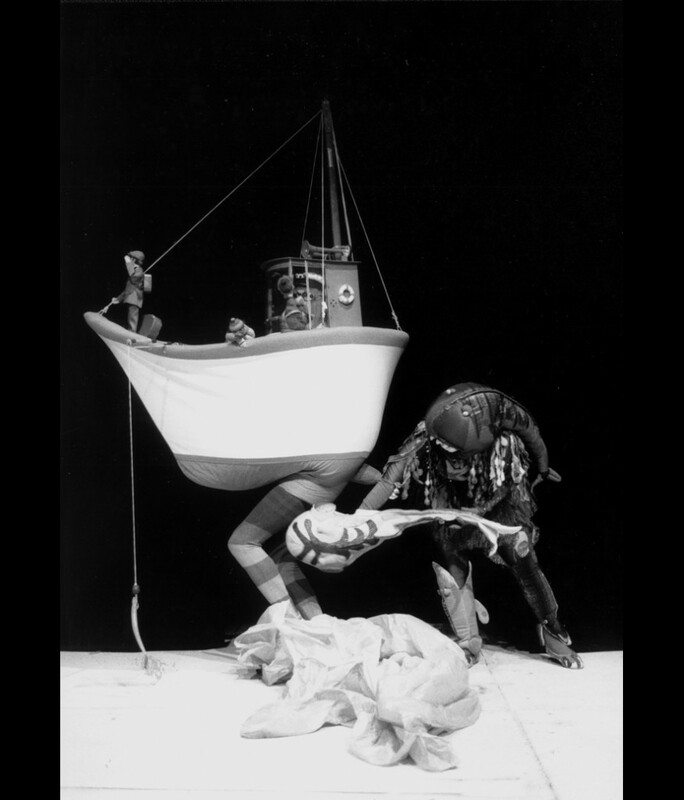 Thanks to these original, series of changes fluctuating between mime and theatre, the Coatimundi company presented a superb poetic story to children. HATS OFF TO THE SEA, the title of the show presented yesterday at the childrens’ village during the MOMIX festival, resonates like a heartfelt cry, like a cheer for this unpredictable piece, never sparing surprise, always capable of the best and sometimes the worst. For almost an hour, Coatimundi brought the young audience on a trip out to sea, guided by a little gray-haired man that you imagine has thrown himself into the water to get away from the city, driven by his desire for the smell of seaweed. 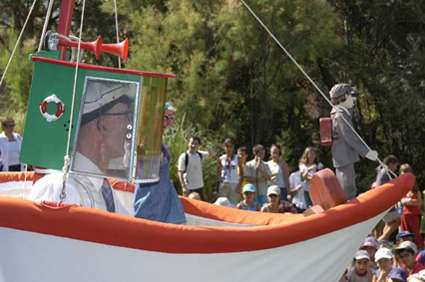 The maritime crossing takes its cues from puppetry shows, mime too, and the sad-sack clown style or even theatre. The scene opens with the sounds of a fog horn, the splish-splash of a trawler is heard. The fishing boat arrives swaying, looking like a giant duck bouy wrapped around the captain’s waist. 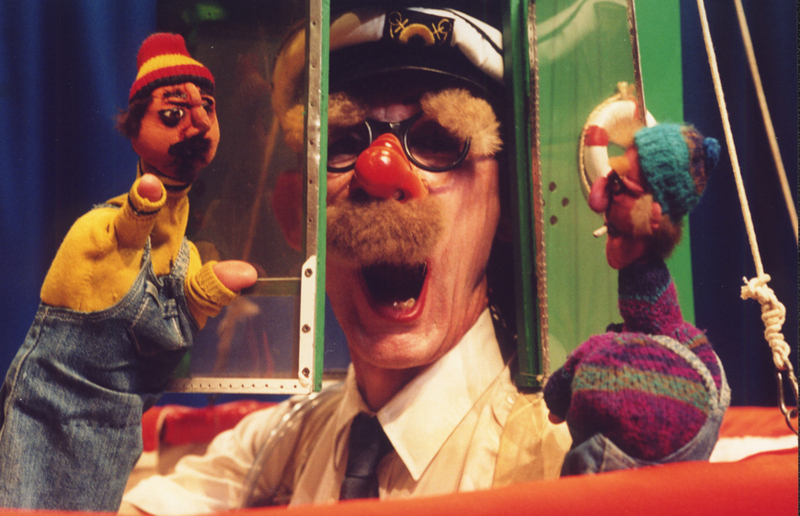 Only his head, covered by a mustache, is seen in the cabin. On the bridge two fishermen prepare for fishing. 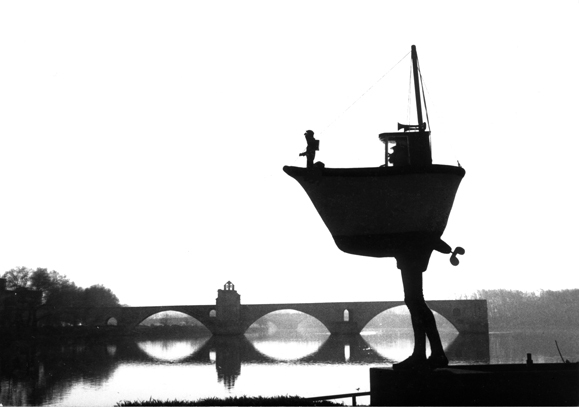 On the bow of the Saint-Michel, a small man in a green suit closely examines the horizon with his binoculars. In the distance, the elements are gaining strength. An actress-dancer makes waves come alive in a supple, gentle way. 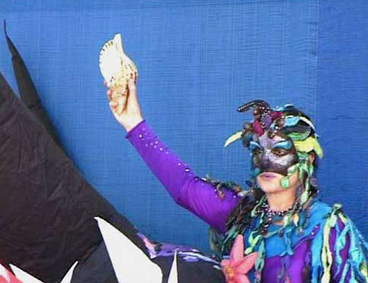 She wears purple fish of all sizes and colors, star fish and other maritime specimens, like jewels on her outfit. The fishing is good and the trawler leaves with its hold full. Another act, still at sea, but animated by children. More than 10 at a time, they are called to hold the imposing square of blue fabric. Guided by the Coatimundi dancer, they make the wave come alive, creating the swells, the troughs, the storms. With great laughter, the little ones shake the big blue blanket with all of their might. The ocean calms down and then breaks loose again. In the third part, the little gray-haired man appears again at the prow of the boat. Life-size, watchful like a mime performing, he puts his bags down with caution. A raised, red and white striped lighthouse, with merry sea gulls and steady light arrives. A little figure sticks the tip of his nose against the tower window. The children are captivated. The gray-haired man with a cap on his head, small mustache and tiny glasses, hides something in the bottom of his bag. He opens a glass jar:: it’s a mermaid. She frees herself and swims around the lighthouse. Carried by the clown in a dark costume, she meets the little puppet who lives there. As throughout the performance, the different levels come together. The puppet becomes the man, the man puts on an act with other puppets. Zany and funny situations come about and the show works perfectly. It all ends on a high note, like fireworks over the water. The hero sprouts wings, flails his baguette of bread like a sword, and like St. Michel, downs an inflatable dragon. 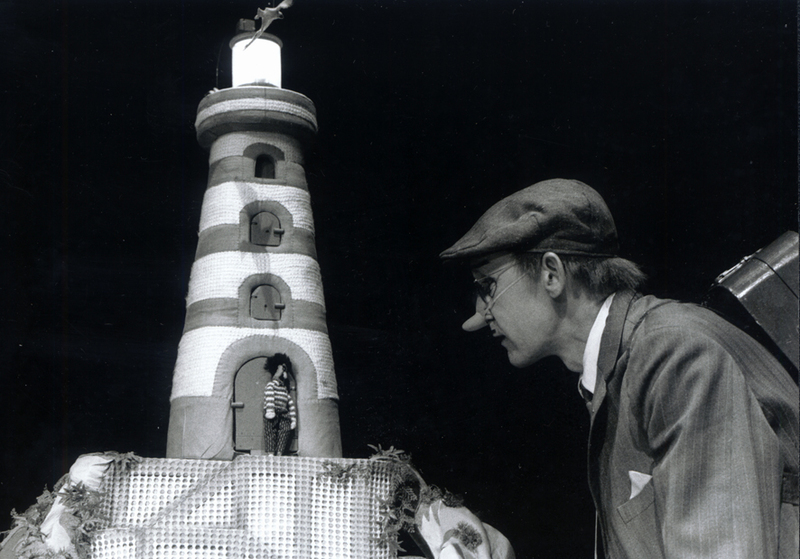 HATS OFF TO THE SEA is a lovely story, a legend a little loony, where everyone finds his niche. An entertaining show.